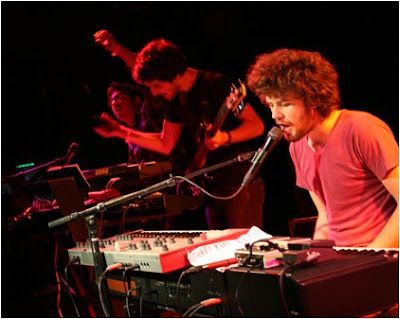 Passion Pit is an indie-electronic outfit from Boston, MA. The debut release, Chunk of Change, was written and recorded entirely by Michael Angelakos. It was originally recorded as a (belated) valentine's day gift to his girlfriend, who then prompted him to give it out to all of his friends and students at Emerson College. Eventually, it became a full-fledged band (at least for live gigs). Pretty soon they started opening up for a number of well known artists, including Death Cab for Cutie. The music he creates is romantic and heartfelt but at the same time totally danceable. Imagine the classic pop of Randy Newman combined with the synth stylings of Giorgio Moroder. I have not been able to get enough of this band for the last few months. The songs are totally catchy and have been stuck in my head for some time. They have been touted as one of the group's to watch in 2009. Be on the look out for a full-length album some time this year. Until then, be sure to pick up Passion Pit's debut ep, Chunk of Change. You can purchase it online at Insound.com or at any fine record shop. Here are a couple tracks off the ep for your listening pleasure. I only had one track from them, "Better Things" which is an awesome track. After downloading these two, Passion Pit are set for better things to come... pun attended! AND... is there anything bad on Insound.com? Have you seen them live yet? I've been meaning to, but I miss them everytime they've come to L.A. They are going to be on the new Alex Patsavas/ Josh Schwartz project Rockville, CA (http://www.rockvilleca.com/) which will have two live performances from the band available for streaming. great tracks, great band. thanks!